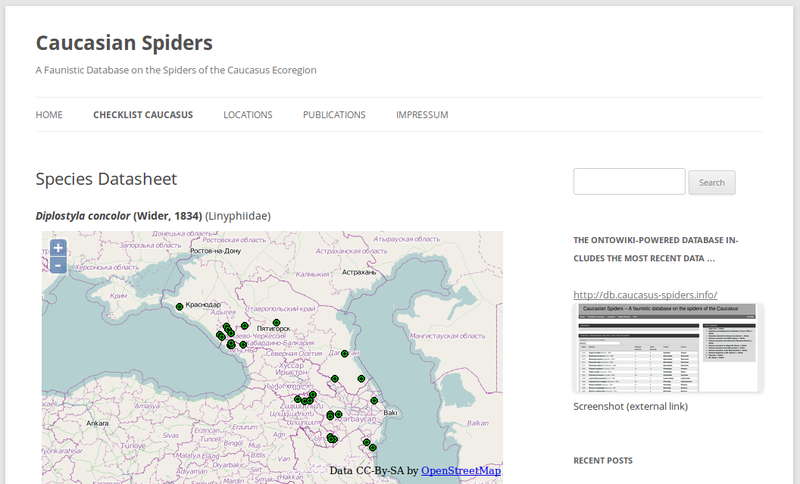 The Caucasian Spiders Database (Version 1.3) is online again: http://caucasus-spiders.info/. It now includes the basic functions like checklists for the Caucasus Ecoregion and the countries Georgia, Armenia and Azerbaijan as well as information and records for all locations in the database and a list of publications relating to spider records in the Caucasus. Development will continue, including both the frontend displaying and summarizing database content as well as updates of the database as new and older publications become available. Dieser Beitrag wurde am Juni 19, 2013 von Stefan in Research, Update veröffentlicht. Schlagworte: CaucSpiders Database. I added a skills section on the Studies & Education page. Dieser Beitrag wurde am Mai 19, 2013 von Stefan in Update veröffentlicht. Schlagworte: skills. I updated the links to the BibSonomy entries and all links to the pdf files in my publication list. Enjoy reading! Dieser Beitrag wurde am Februar 24, 2013 von Stefan in Update veröffentlicht. Schlagworte: Publications. These pages are still in the making. So far, I sketched my research interests and provided (a still crude) publication list together with some information on my educational background. Come back these days to explore more contents as the site is growing. Dieser Beitrag wurde am Februar 8, 2013 von Stefan in Personal Information, Update veröffentlicht. Schlagworte: study.